U-CAN!. 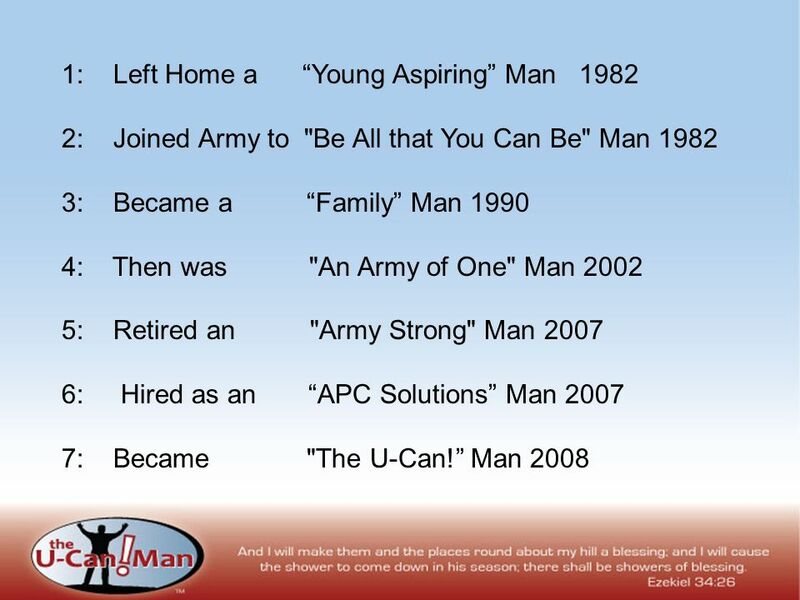 Brother John Wallace Isom Jr The U-Can! 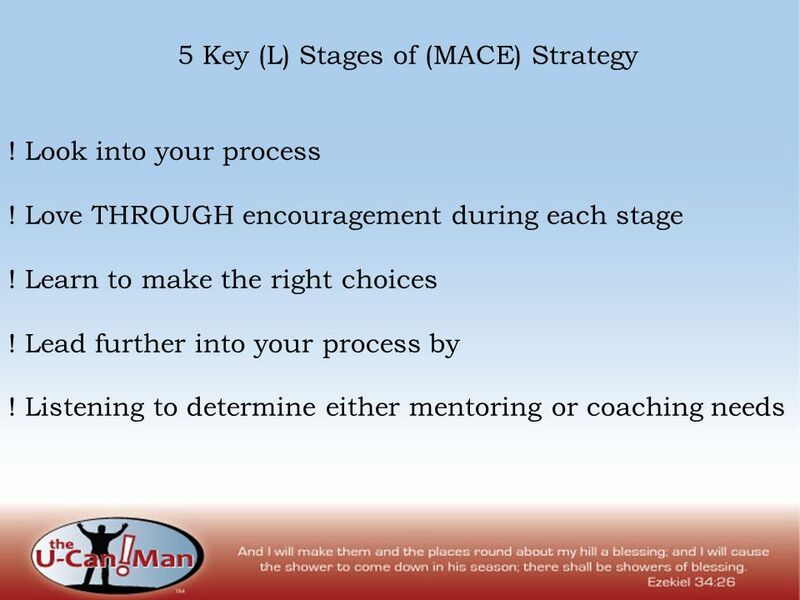 Man Mentoring and Coaching Encouragement (MACE) Strategy Revealed by God 08/08/08. 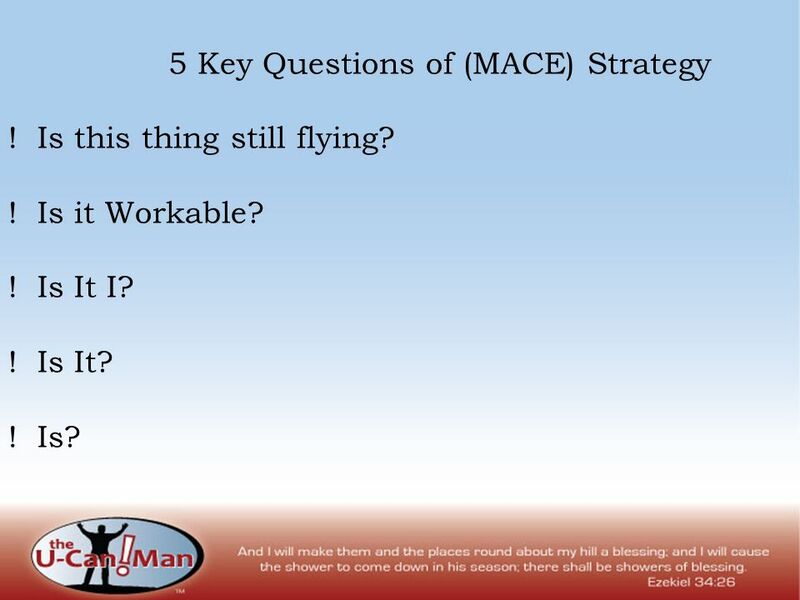 5 5 Key Questions of (MACE) Strategy ! Is this thing still flying? ! Is it Workable? ! Is It I? ! Is It? ! Is? 11 Life is a journey. 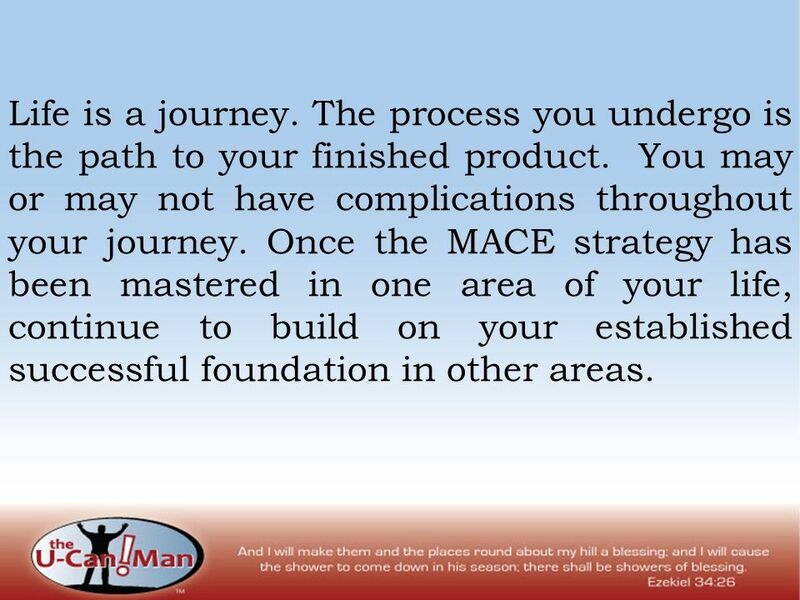 The process you undergo is the path to your finished product. You may or may not have complications throughout your journey. 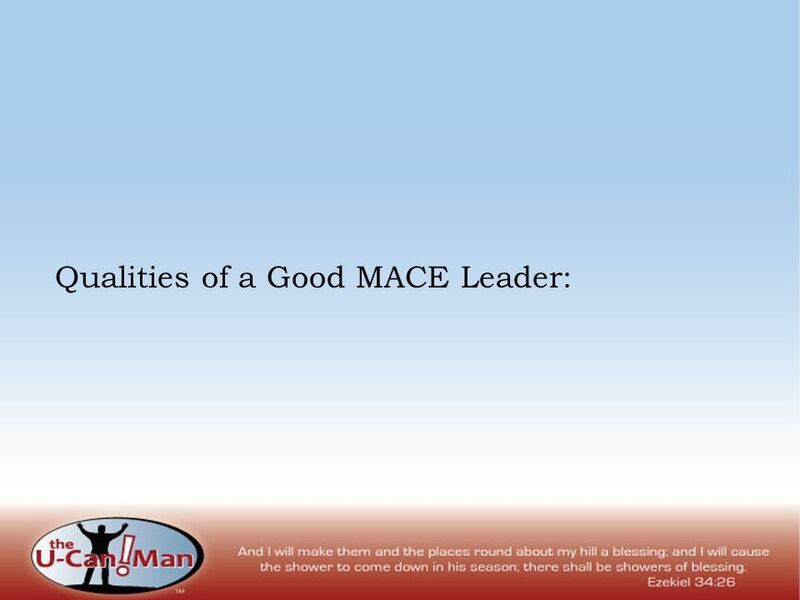 Once the MACE strategy has been mastered in one area of your life, continue to build on your established successful foundation in other areas. 12 Is This Thing Still Flying ? 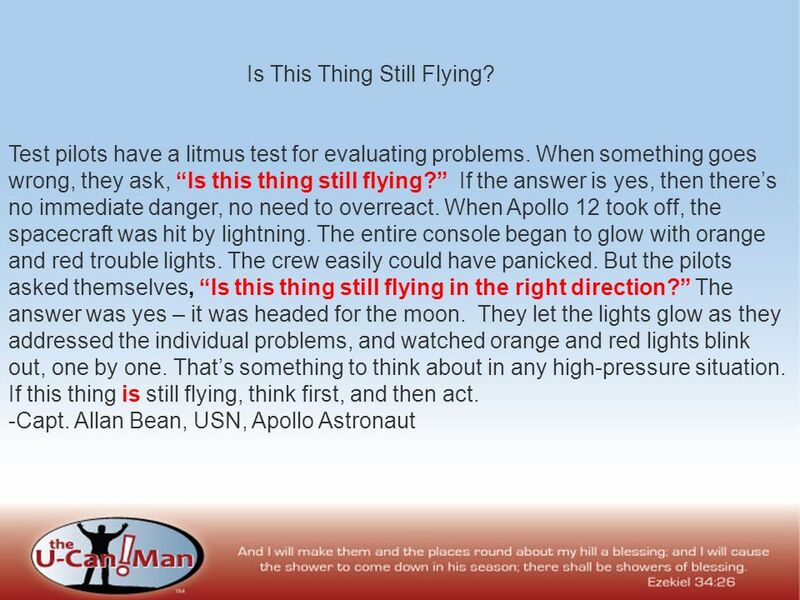 Test pilots have a litmus test for evaluating problems. When something goes wrong, they ask, Is this thing still flying? If the answer is yes, then theres no immediate danger, no need to overreact. When Apollo 12 took off, the spacecraft was hit by lightning. The entire console began to glow with orange and red trouble lights. The crew easily could have panicked. But the pilots asked themselves, Is this thing still flying in the right direction? The answer was yes – it was headed for the moon. They let the lights glow as they addressed the individual problems, and watched orange and red lights blink out, one by one. Thats something to think about in any high-pressure situation. If this thing is still flying, think first, and then act. -Capt. Allan Bean, USN, Apollo Astronaut. 13 If It Is! Always Remember U-CAN! Download ppt "U-CAN!. 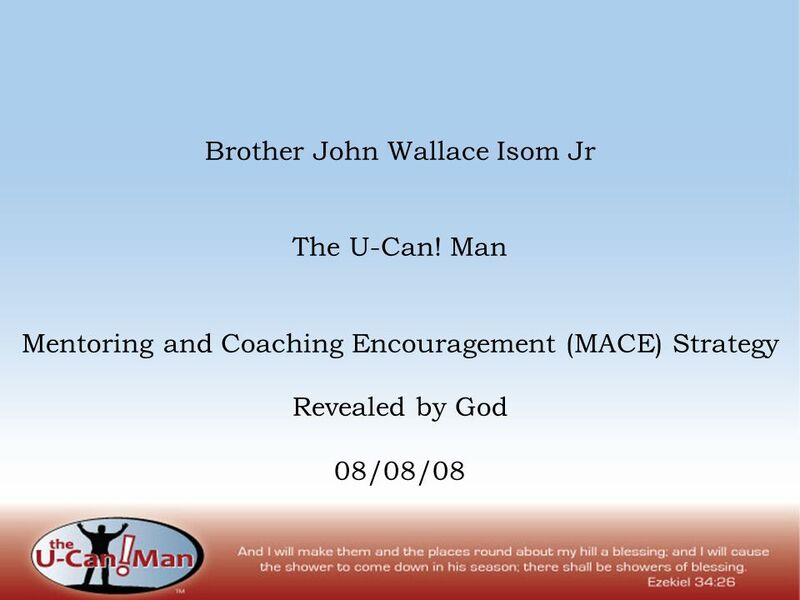 Brother John Wallace Isom Jr The U-Can! 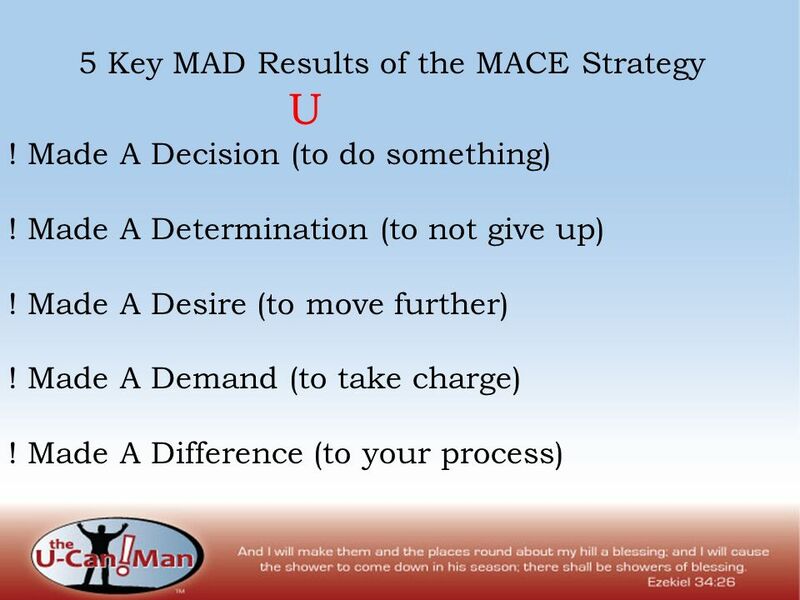 Man Mentoring and Coaching Encouragement (MACE) Strategy Revealed by God 08/08/08." U-CAN!... (WHAT) U-CAN! CHANGE The key to creativity is bringing the right two or more pieces of information into our conscious thought at the same time. What is Government? Imagine that all the adults vanish from the school building and the students are left in charge. Practical Learning: Achieving Excellence in the Human Services International Conference January 2008 Edinburgh International Conference Centre. Delivering Outstanding Tutorials new National Occupational Standards for Personal Tutoring and GROW coaching model. Electrical Circuits are AWESOME! By: Anne Shigley Click the blue POWER button to begin. Click here for audio. Relationships. “Education is not the filling of a pail, but the lighting of a fire.” ~ William Butler Yeats. PRODIGAL GOD Luke 15: And he said, “There was a man who had two sons. 12 And the younger of them said to his father, ‘Father, give me the share. WHY SHOULD WE INTERVIEW STUDENTS. Presentation topic: I choose interviewing children as my final presentation topic because from taking Principles of. 1. Serving- An overview 2. Serving in the House 3. Serving in the Home 4. Serving in the “Real” World Note : All topics are pastors sermon discussions. It had a man that he had two curious and intelligent children. The girls always made many questions. Introducing 1 Chris Rogers Asst. Scribe. Coaching & Mentoring. 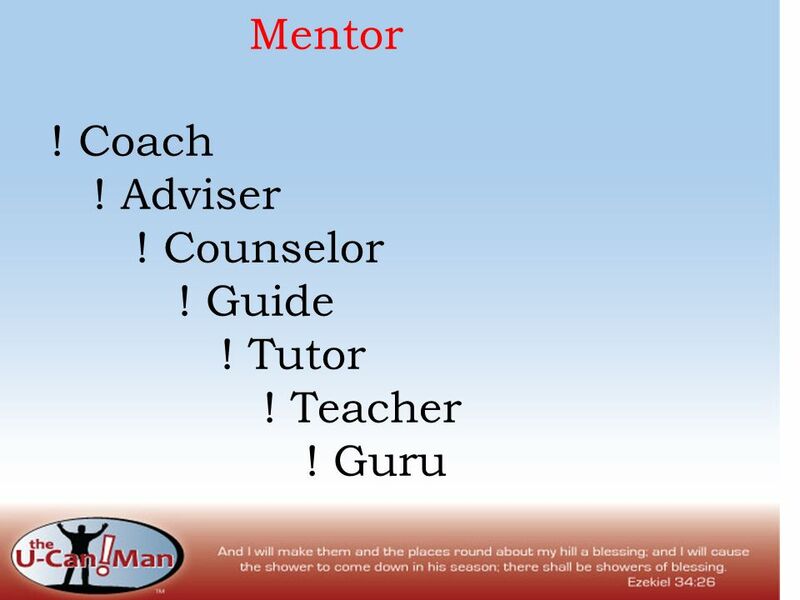 Teamwork—Connecting Sunday School to Life Coaching and Mentoring Leaders. Peter Carafano, M.Ed. Associate Professor, Science Department Florida State University Schools.